As part of our efforts to discover more neighborhood restaurants that usually go unsung in the press, we discovered this new, locally owned and operated restaurant. 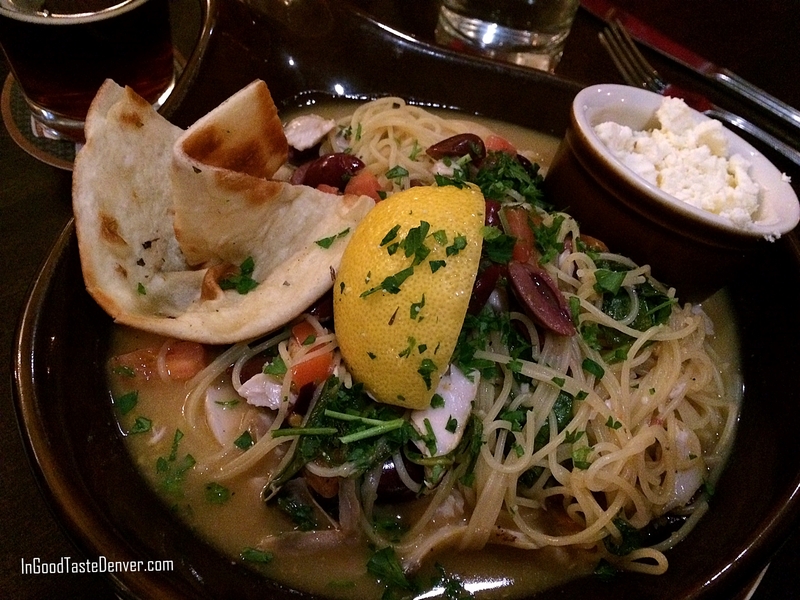 Recently, we dined at Salati Italian Street Food, in Stapleton’s Northfield area, a new eatery fueled by the passion of a veteran restaurateur who fell in love with Italy – and it shows.The atmosphere is warm and the employees are friendly. Motivated by enough tequila mule cocktails, great brews and conversation, we could have stayed for hours. Feel like you’re inside a wine barrel? That’s the idea at Salati Italian Street Food. At dinner, the same options are $11, still incredibly reasonable given how delicious and plentiful they are. But this time, diners can meander to the left of the restaurant into the bar/lounge/dining area. 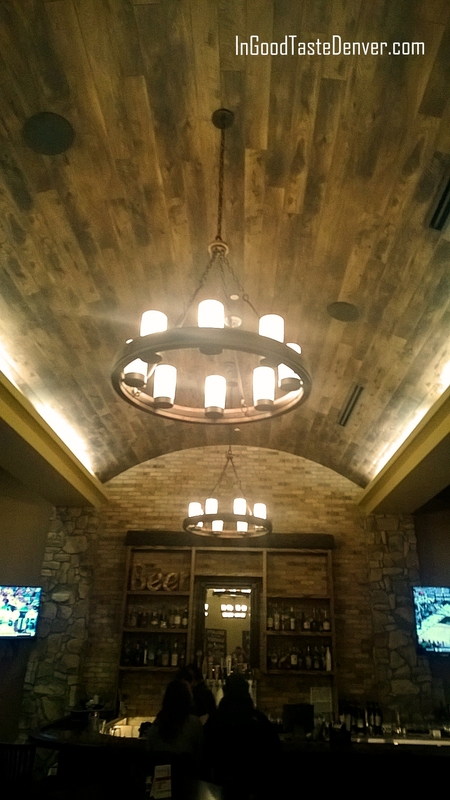 Warmed with stone, booths and comfy chairs (a domed, wood ceiling covers the entire restaurant, mimicking the inside of a wine barrel). In addition to the salad/pasta/Piadina options of lunch, evening brings the addition of small plates to share and entrees as well as a full bar. We shared small plates ($10 each) including Barbajuan, fried ravioli with spinach and basil, sausage, cheese, risotto and alfredo sauce. It was divine, with the light fried shell accompanied by beautiful, Italian aromas and blended with cheese for a just-right bite. Crispy Brussels sprouts, with red onion, chili flakes, Italian spices and a mellow balsamic reduction made the sprouts of childhood a distant memory. Salati Tots take sweet potato fries to a new level, as nugget-size nibbles with a Parmesan cheese blend and syrupy balsamic reduction drizzle. Under the menu heading of “Salati Signature Dishes,” each $11, we enjoyed Sausage and Peppers Diavolo filled with just-right spicy sausage and well-sautéed peppers accompanied by pancetta, pepperonchini and a vodka sauce on penne pasta. This was a great dish to share between two adults or even among a table of friends. Salati is two concepts in one. During the day, the bright, right side of the restaurant serves as a place for quick meals where you can walk up to the counter and order one of three forms of meal – salad, pasta or Piadina, a flat-bread wrap sandwich that inspired the owners to open Salati after enjoying the dish on the streets of their Italian honeymoon. With any of the three choices, choose a protein, including the 36-hour-prepped pork (Porchetta) then add sauces or dressings and a variety of vegetable toppings. The idea is to make the dish your own, catered to your own tastes. Take it to go or have a seat. Pricing is easy at $9 for lunch for any of those choices, created to your liking. 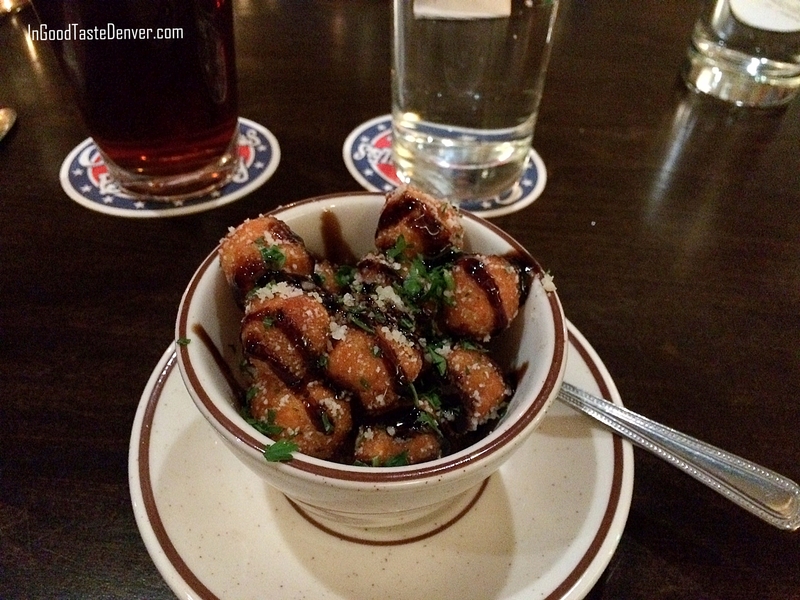 Cute and gussied up, sweet potato tots with a balsamic reduction drizzle. We also had the Mahi-Mahi Picatta with kalamata olives, tomato, garlic in a garlic/olive oil sauce over pasta with fresh parsley. It was full of flavor. The 4 Cheese Porchetta Piadina takes the guess-work out of deciding what to put in a Piadina to customize it (which you can do during the day by going through the Express line). That slow-cooked pork is mixed with garlic alfredo, onion, mushrooms and a four cheese blend, all wrapped up in a warm and toasty Piadina. We loved that the accompanying mixed greens salad had cannellini beans in it for a little something special. My my, mahi mahi done up as a picatta. 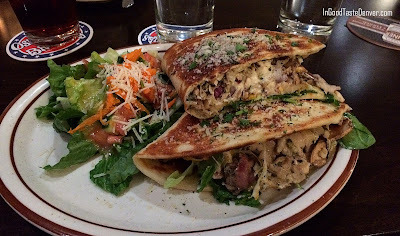 The Piadina, the sandwich that started it all. Fill it with exactly the ingredients you want. Kid meals, for “Bambinos” are $6 and include spaghetti and meatballs, mac and cheese and a cheese or pepperoni pizza, all served with a drink. The level of quality of the food at Salati isn’t an accident. We read that the Culinary Director, who came up with the recipes and guides the kitchen staff, is classically-trained and has worked in restaurants all over the world. You’ll probably be hearing more about him in the future. His name is Shahin Afsharian Campuzano. The owner of Salati, T.C. Clark is also part of the appeal of the restaurant. He is warm and welcoming and is happy to hear any kind of feedback. He clearly wants to make the restaurant, which is obviously a labor of love, a big success. With easy-to-understand, and totally affordable pricing, we appreciate that Salati makes dining here really approachable. We were told that signage that better explains the different functions of the two sides of the restaurant is coming soon, which will help. Meanwhile, Salati Italian Street Food is doing a great job being all things to all people – express lunch locale, kid-friendly, perfect for happy hour, date night, groups and gatherings of friends. Salati Italian Street Food is located at 8270 Northfield Blvd #1485 in Denver right across the street from Harkens theater. For news and reviews of other restaurants as well as theater, travel and movies, visit www.InGoodTasteDenver.com.